One thing I’ve always rated Snapchat for is its steely determination to succeed, despite Facebook and Instagram making it bloody difficult. No matter how many times features get stolen or users say goodbye, Snapchat keeps innovating and pushing ahead. And all in all, I think it’s paying off. It might not be quite where it wants to be, but it is somewhere – and that says a lot. This week marked the company’s first partner summit, and the announcement of a bunch of new features – including some major gear shifts. 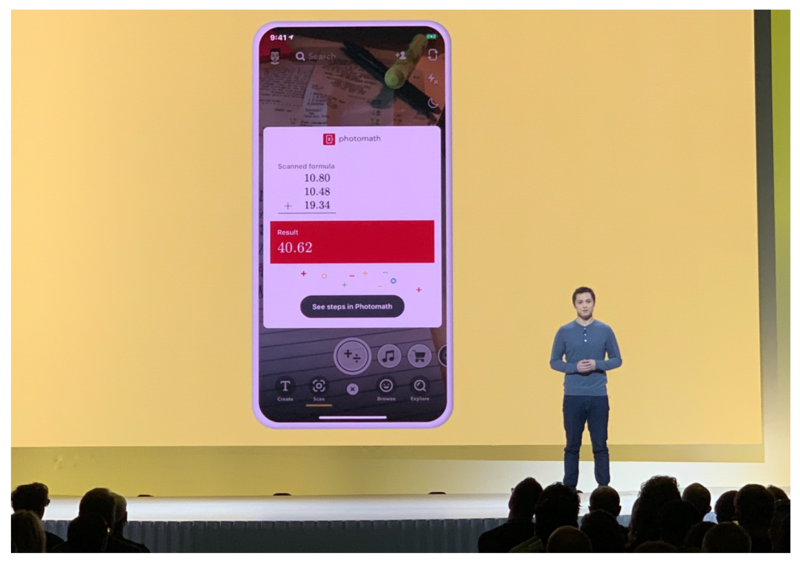 Audience Network: launching later this year, Audience Network will allow developers to run Snapchat ads within their apps. This opportunity for advertisers to reach both users and non-users could be big. Story Kit: part of Snap Kit (just like Audience Network above), Story Kit will let developers embed Snapchat Stories onto their platforms. Tinder and Houseparty have already signed up. New Snap Originals: a whole new batch of original programming will be arriving on the Discovery page in May, including an afternoon celebrity entertainment show from Buzzfeed. 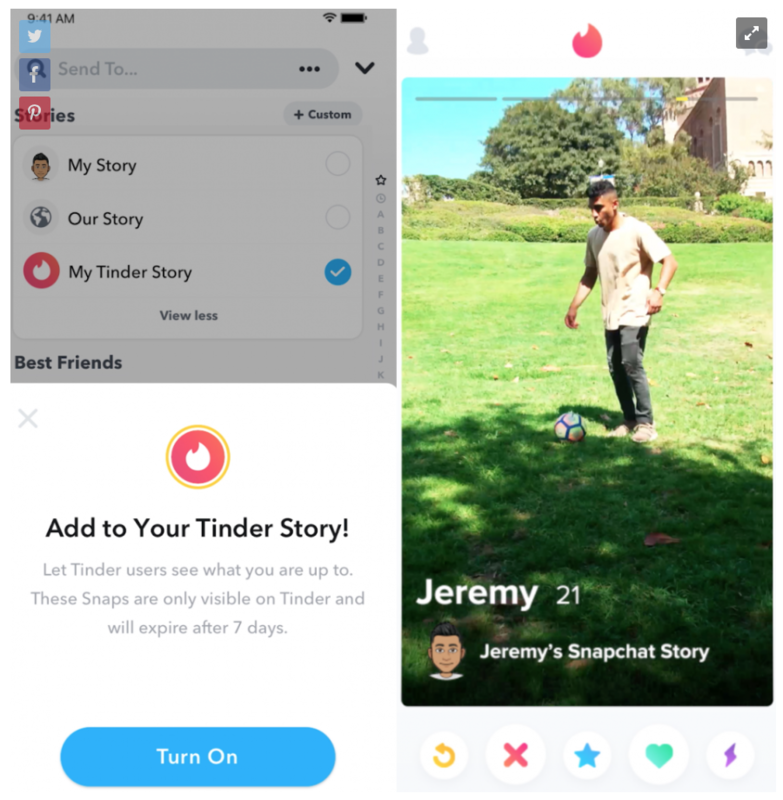 Snap games: just as we reported a few weeks ago, Snapchat is doubling-down on gaming, introducing a new platform with a selection of real-time, multi-player games you can play while chatting. Scan: taking AR to the next level, Scan will let you use the in-app camera to do way more than before, including things like solving maths problems (!) and enjoying effects for monuments, pets and people. If all that wasn’t enough, Snapchat also just redesigned its Android app, making it faster and less buggy than ever. Twitter conversation threads can get very messy (and not just because of trolls and other weirdos). Even something as basic as following a conversation’s flow can be difficult, with various people jumping in and out, and replying to different comments made along the way. Well Twitter is on a mission to make this a problem of the past. It’s currently playing around with a variety of new features to make following conversations easier. The latest of these is labels on replies, which will include Author, Mentioned and Follow. These labels may or may not be around for long, depending on how users react to them. Whichever we end up with, you can be sure that Twitter conversations are undergoing improvements – all designed to enhance the user experience. Just last week, I showed you data proving the importance of post-purchase communications. Well delivery updates are a huge part of this – many studies have shown that people value regular updates, even when the news is bad (e.g. delayed deliveries). You might assume that most businesses are on top of this and going out of their way to keep customers in the loop. But that’s not necessarily the case. Shipping company ParcelLab has recently taken a close look at the delivery processes of the top 100 UK retailers. It found that only 11% communicate with shoppers directly during the shipping period (excl. confirmation). Of the remainder, 62% leave it to the delivery carrier to get in touch, and 27% simply go radio silence. Only 4% tailor post-checkout comms to the customer. Where’s the personalisation, people!? There’s just no way to escape this being a major missed opportunity. 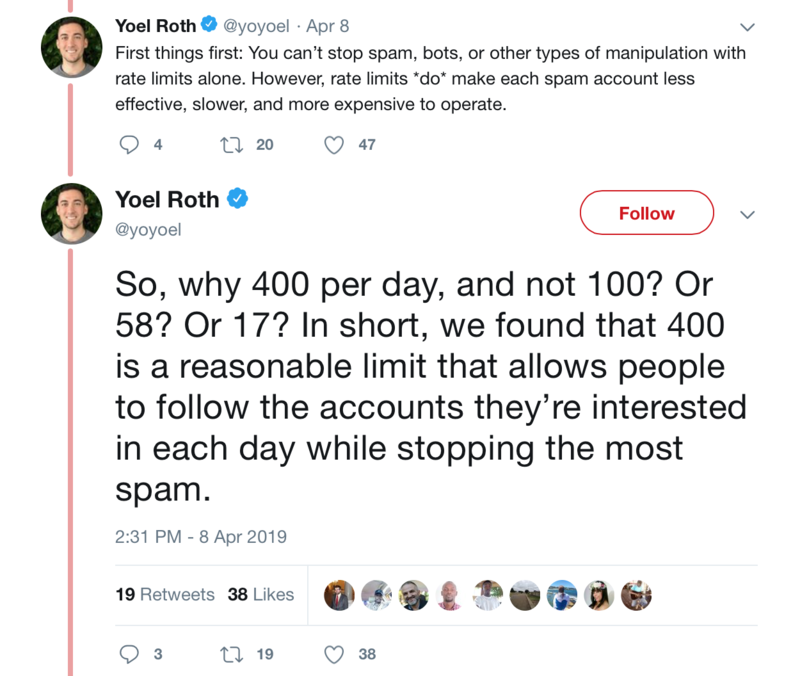 400 is a lot of accounts to follow in one day. In fact, Twitter has decided any more than this is too many, and might signal you’re a spammer. Before this change, the limit was 1,000. But hopefully none of you knew that. It’s unlikely this will affect good marketers too much. Although some businesses still have a manual follow-unfollow strategy, doing it in huge swathes is not best practice. Also, really, who has the time? Facebook is putting new brand safety measures in place to help reassure advertisers that ads will be shown alongside content they deem appropriate. There will be three new control levels: limited, standard and full. They will apply for ads within Instant Articles, in-stream videos and Audience Network. Selecting “Limited” means your ad will be fully protected. So it won’t be shown alongside bad language, for example. The protection level then reduces on a scale from “Standard” to “Full”. The latter offers minimal protection. The new categories are being tested and are due to roll out within the next few weeks. They are in response to demands from advertisers to help protect their brands from appearing next to hate speech or misinformation. As The Drum points out, the issue is of particular concern right now following the tragic Christchurch mosque shooting in New Zealand, which was broadcast live on the platform. Although the video wasn’t monetised, it of course raises huge concerns among advertisers over where ads might show up.